» The ‘Second Screen’: Is This App Really Necessary? The ‘Second Screen’: Is This App Really Necessary? But the second-screen phenomenon has become increasingly difficult to ignore. 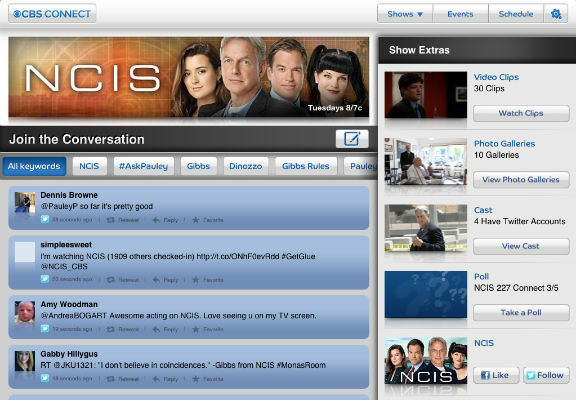 Network executives are citing GetGlue ratings as a factor in their renewal decisions. More and more TV episodes are littered with special Twitter hashtags, along with pitches for dedicated apps that offer exclusive bonus content. The major TV content providers are working very hard right now to have a say in where and how fans gather to share their thoughts. So I spent February trying to see if there’s anything to these second-screen apps. I tried some of the network-branded apps, such as CBS Connect, Fox Now, USA Anywhere, and Showtime Sync; and I tried some of the more social-oriented apps, such as GetGlue, IntoNow, and Zeebox. I used them while watching the Super Bowl, the Grammys, the Oscars, and regular TV programming; and I used them both while watching live and watching later on DVR. What I did not do was use GetGlue and such for their “check in”/badge-collecting functions, which has been their primary selling point in the past — at least according to an impromptu poll I took of my Twitter followers and Facebook friends. With the exception of one fellow critic, who told me he likes the ego-stroke of getting praised for his pithy GetGlue comments, nearly everybody who responded said they use these apps almost exclusively for keeping track of what they watch, and for the “game” of trying to collect more points than their friends and family. I don’t doubt the fun of that, even if it’s not something I’m interested in doing. I was more interested in learning if the specific “watch along” features of second-screen apps offered anything I haven’t been getting from my usual TV-watching posture: reclined, laptop open, Wikipedia at the ready. The answer, by and large, is no. But it’s a qualified no. The biggest letdown was the network-branded apps, given their potential to provide something proprietary. I watched Shameless while using Showtime Sync on my iPad, which initially seemed nifty, as the app served up scene-specific quizzes, polls, and stills. But minutes would pass before any one of these goodies were replaced by another (with a countdown clock at the bottom of the screen letting me know when the next extra would be coming up); and the bonuses didn’t really enhance the episode so much as distract from it. I’m not really sure what value it added for me to take a poll guessing whether or not Frank would pass a drug test, or to be quizzed about what kind of illness Monica has. I had better luck with GetGlue, IntoNow, and Zeebox, which are geared toward capturing the attention of TV-watchers in general, not just fans of a specific channel or show. Zeebox, for example, puts a little shaded Twitter bird next to each TV show in its program guide, with the amount of shading related to how much chatter there is on Twitter about that show at that exact moment. If you’re a person who’s curious to know what other people are talking about, Zeebox and GetGlue and the rest can help with that. 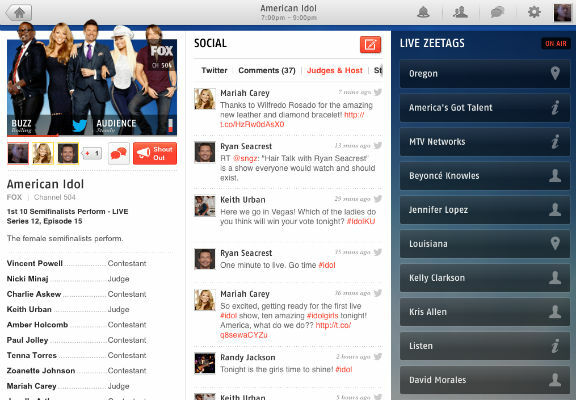 I also found Zeebox more useful than CBS Connect during the Grammys and the Super Bowl, thanks to a feature that curated the Twitter stream, offering feeds that only carried tweets by famous musicians in the former case and professional athletes in the latter. I used Zeebox again during the Oscars, and appreciated how the “Live Zeetags” feature provided a way to click and read more about the various presenters — essentially doing all my Googling for me. Of course when I say “non-network-branded,” that somewhat misrepresents how independent second-screen apps like Zeebox and GetGlue actually are. They do have arrangements with content providers and advertisers, and they steer their users accordingly. When I asked my friends about their experiences with these apps, I heard from a couple of colleagues in academia who’ve been studying TV-watching trends and social media, and they sent me some of their research. Cory Barker, co-founder of the This Was Television blog and a PhD candidate at the University of Indiana, passed along a paper he wrote about using GetGlue and Viggle, in which he described how he sometimes received points or badges in the “game” part of these apps and sometimes didn’t, depending on whether he was watching an episode live, whether it was an episode these services were promoting, and even whether he watched the commercials. What would make for a satisfying second-screen experience? That’s something I’ve thought a lot about during the past month, especially in regard to the network-branded second-screen apps, which could be offering much more value than they are now. I can tell you what I want — and in some cases need — when I’m writing about a show. I’d love a full, accurate list of every guest actor and his or her character, along with the names of the writers and director, and a list of any songs in the episode. These are often the hardest things to track down, even from a show’s dedicated website. And what’d be really great is if more second-screen apps were like the ones that have been developed for movies, in conjunction with their release on home video. I downloaded the second-screen app for The Avengers Blu-ray and found it pretty incredible, providing production stills, sketches, trivia, actor bios, and original comic book pages, all in perfect sync with the movie. Pre-iPad/iPhone, some of the more adventurous movie studios — Disney, most notably — experimented with providing just that kind of behind-the-scenes material on their DVDs, via picture-in-picture. But it makes much more sense to do it via a second-screen app. There are TV shows that would benefit from this kind of obsessive detail. When Lost was on the air, I used to listen to every podcast and watch every video-blog that the show’s producers released. If that had all been packaged into an app that I could’ve fiddled with while watching the show, I would’ve suffered through all the commercials to get it. But this is crucial: I would not have wanted any such Lost app to be functional for only one hour a week. The kind of ephemera in the Avengers second-screen app is great for a second viewing; it’d be way too distracting to keep up with while watching the movie the first time. So it goes with TV: Using a second-screen app to carry on conversations, take polls, and consume trivia while watching a new episode hardly seems like what the actual creators of the show had in mind. Here then is where we come back to that old disconnect between what consumers want and what content providers want them to want. Sometimes the disconnect is just a matter of obstinate cluelessness, like when restaurants insist on filling their websites with Flash and PDFs, rather than just their hours of operation and menu. The second-screen phenomenon, though — and specifically the networks’ recent aggressive involvement with it — is more a case of established organizations trying to co-opt or cash-in on something that originally happened outside their purview. It could be more useful someday. Right now, however, the majority of the second-screen apps aren’t solving a problem, or even providing a new kind of entertainment that didn’t exist before. Instead, they’re mainly just taking what Twitter and Wikipedia already do just fine and slapping their own logo on it. Noel Murray (@NoelMu) is a freelance critic from central Arkansas whose writing on film, television, music, and comics appears regularly in the A.V. Club and the Los Angeles Times.